...by the latest Dragon Speech Recognition software that can empower you to write up to 3x faster than typing. Leveraging the latest Deep Learning Technology, Dragon constantly learns and adapts to your unique voice. It will have you writing so fast you could even write a book in 30 days! Watch the Season 3, Episode 1 of The Cath Vincent Show to find out more. 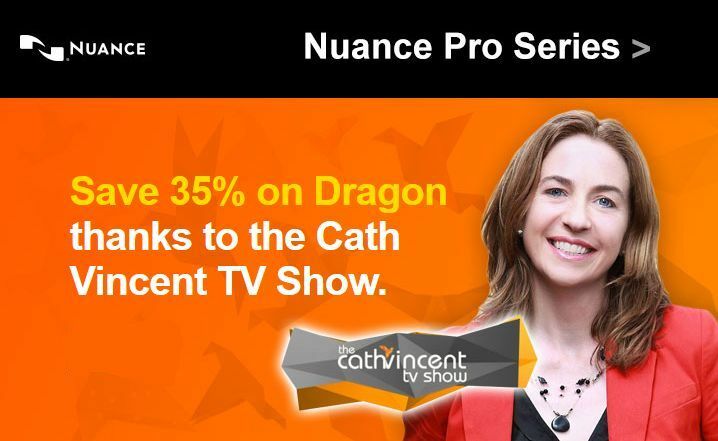 Cath has arranged with Nuance for you to save 35% by taking advantage of these great Dragon professional software offers.